Deb's Cup of Tea: What's This? We met snow, I think for the first time last night. I kept the back door open when I came home and then called to them. Mija came first. Ears pitched forward, it took her a couple of minutes to set foot outside the back door. 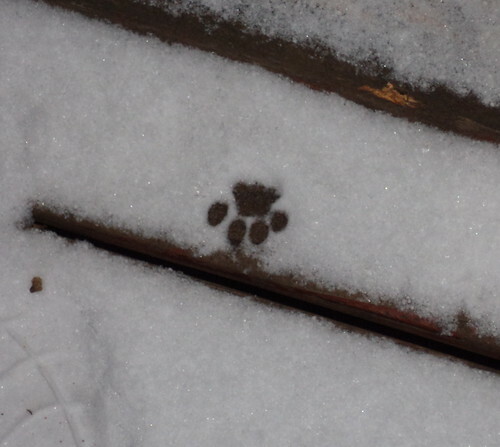 She got that one paw in the snow and then you could just see the wheels in her head turning. "Oh gosh! This is wet and cold!" She couldn't get back into the house fast enough. I had to call Pilchard several times to come out. But when she committed to coming outside to be with me, she committed. She came over to the stairs where I was standing, but I couldn't get a clear shot of a black cat against a white background. When I took a step up to get a better angle, she bolted back inside. Some day, I'll get that shot. I'm fairly certain this was their first experience with snow. Val had an apartment without a deck so they would have just seen it but not been out in it. 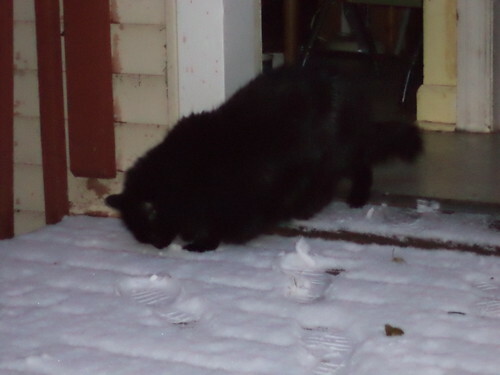 The cats that have gone over the Rainbow Bridge didn't mind the snow at all and would willingly go out onto the deck. In fact, we had to watch if it was a foot deep or more as they were fearless to see what was beyond that ridge over their heads. 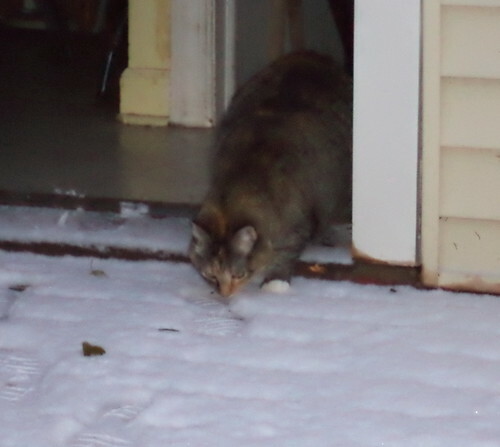 More than one time, we'd watch a cat jump into the snow, only to have to rescue them because it was over their heads. I won't have that problem with these two. We have experienced snow. We were only too happy to come back inside and curl up with mom in the recliner. Wonder what scents they were picking up. Does snow have a smell? and mom said cars were sliding on it! We would like to make a purrfect pawprint just like Pilchard's!! We will have to wait as Mom said it will be crazy rainy and windy tomorrow.